Mattel came out with the "Elly May Barbie" in December; Donna Douglas played Elly May Clampett on CBS from 1962 to 1971. Donna Douglas played Elly May Clampett on hit TV show "The Beverly Hillbillies"
(CNN) -- The actress who played critter-loving bombshell Elly May Clampett in the hit 1960s television series "The Beverly Hillbillies" is suing Mattel over its "Elly May Barbie" doll. 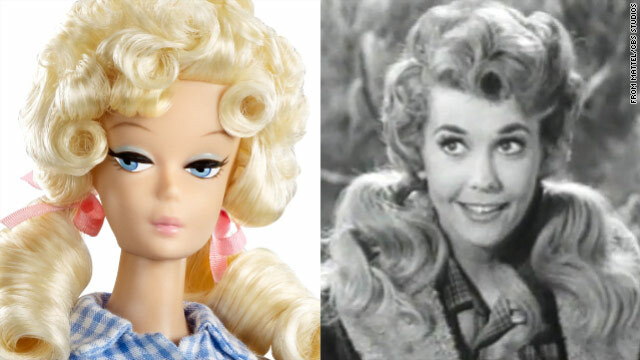 Donna Douglas' federal lawsuit, filed in Louisiana, claims the toymaker is "engaging in the unauthorized use of (her) name, likeness, image and attributes" as Elly May. Douglas never gave Mattel permission to market the doll or use her endorsement to promote it, according to court papers. Yet, the suit says, a photo of Douglas in character as Elly May is used in the packaging, and Mattel boasts in promotional material that the doll "captures the essence of the classic '60s TV character and show." Mattel said through a spokesman that the company "licensed the rights to 'Beverly Hillbillies' for this product through the appropriate channels." Douglas' attorney, Philip J. Shaheen, did not respond to requests for comment. Douglas' suit seeks damages in excess of $75,000 for each of four alleged violations of her right to control her public image, likeness, endorsements and publicity as Elly May Clampett, a character closely identified with her. She is demanding a jury trial. "The Beverly Hillbillies," starring Buddy Ebsen, Irene Ryan, Max Baer Jr. and Douglas, ran on CBS for nine years, from 1962 through 1971, and was immensely popular. For the first two seasons, it was the No. 1 show on television. It lives on in syndication 40 years after the final show. Hills, that is. Swimmin' pools, movie stars. ..."
Douglas, who lives in Zachary, Louisiana, played Elly May Clampett "in all 274 episodes" of the show, according to court papers. Elly May, a naïve, buxom tomboy with a Southern drawl, wore tight jeans, a rope belt and a checkered or plaid shirt. Like her character Elly May, Douglas is quite fond of animals. After the end of "The Beverly Hillbillies," she had successful careers as a Beverly Hills real estate agent and as a gospel singer. "She was a slice out of my own life. And of course 'The Beverly Hillbillies' was a story about the American Dream. No matter who tried to slicker us or take advantage of us, we always came out on top." Douglas continues to make public appearances in connection with her Elly May character, according to her lawsuit.